Beautiful isn't it? 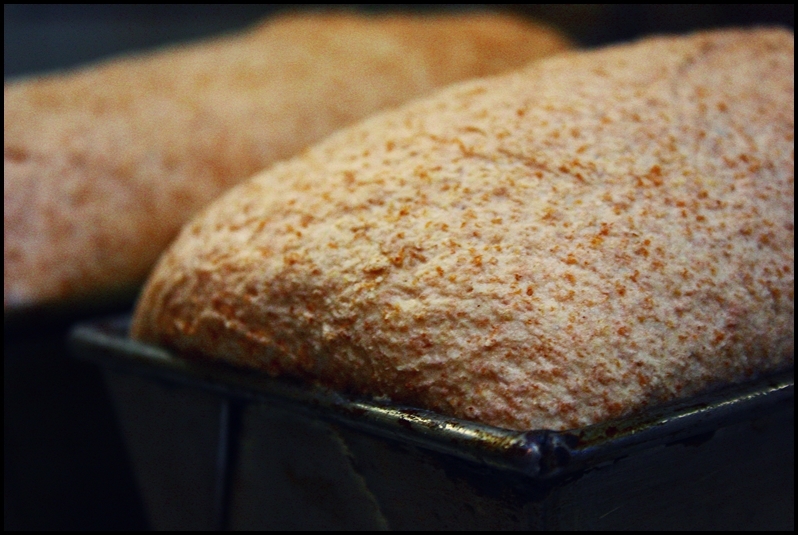 Bread made with 100% whole wheat flour and just a few other ingredients. If you've been to this blog before you know that my diet is the antithesis of a low-carb or gluten-free diet...the bulk of my diet consists of bread, rice, and pasta (with vegetables, meat, and fish). And for this reason about ten years ago I gradually switched to cooking and baking primarily with whole wheat/whole grains--because they are really good for you--and it was a learning curve to say the least. And while my Ezekiel Bread recipe is one of my favorites, and indeed the most popular post on this blog, the bread that is pictured is the bread that I make most often...it is my "everyday bread." Whole wheat flour and a few other ingredients; that's it. It's easy to make, really delicious, and super healthy. To see more explicit pictures of it being made and to read more about the process of controlled fermentation, read this post. The read more about how to bake with whole wheat flour, read this article in Artvoice. Otherwise, the very simple recipe is below. In one bowl make a preferment by combining 2 cups of whole wheat flour with 2/3 cups water and 2 teaspoons of instant yeast. Begin the autolyse in another bowl by combining 4 cups of whole wheat flour, the gluten, and 1 ½ cups water. Stir each bowl just enough to combine the ingredients, taking care not to get yeast into the bowl with the autolyse. If the contents in either of the bowls need more water, add a small amount. Cover both bowls and allow to rest and ferment for 30-90 minutes, during which time the preferment will begin it's job multiplying yeast and fermenting flour, and the autolyse will soak the grain, swelling the gluten. After an hour or so, combine the ingredients from both bowls into the bowl of an upright mixer fitted with a dough hook. Add the honey, olive oil, salt, and 3 teaspoons of yeast (add the yeast and salt on opposite sides of the bowl). Knead the dough on medium speed for about 8 minutes. Place the dough in a lightly oiled container, cover it loosely, and allow to ferment for 1-2 hours, or until doubled in bulk. Deflate the dough and allow it to ferment an additional 30 minutes. Turn the dough out onto a floured work surface and cut it into 2 or 3 pieces. Shape into loaves and place into lightly oiled pans. Loosely cover the loaves with plastic wrap and allow to ferment for 30-60 minutes, or until double in size and when gently touched with a fingertip an indentation remains. Bake the breads for about 30-40 minutes, adding steam to the oven a few times (either with ice cubes or a spray bottle) and rotating the breads every ten minutes. The breads are done when they are dark brown and sound hollow when tapped upon. Remove the breads from their pans and allow them to cook on a wire rack for at least 10 minutes before slicing.